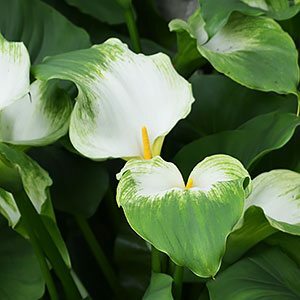 With good green foliage year-round and striking green and white flowers in spring to summer Zantedeschia aethiopica ‘Green Goddess’ is a favourite with gardeners and florists alike. It is very easy care, and a lot less funereal in appearance to the white variety. This is a plant that grows from rhizomes, over time it will spread to form a large clump. The flowers appear on tall stems and are held high in the foliage. This is an excellent plant to grow in a shaded position where the flowers add interest in spring through summer. This is a very easy to grow variety, it does prefer a damp soil, however it will tolerate dry spells as long as it is grown out of direct sun. Mulch around the plant to keep moist. Propagate by dividing the tubers or rhizomes in winter. Soil Humus – Well drained humus rich and moist soils. Spread – Will form a clump to 1m over time.